The American Journal of Numismatics, 1866-date. With many plates, illustrations, maps and tables. Less than a dozen complete sets of the Journal remain on hand. Prices on application. Those wishing to fill broken sets can secure most of the needed volumes separately. An index to the first 50 volumes has been issued as part of Volume 51. It may also be purchased as a reprint for $3.00. Adolph Alexander Weinman was born on December 11, 1870. This date fixes his present age. 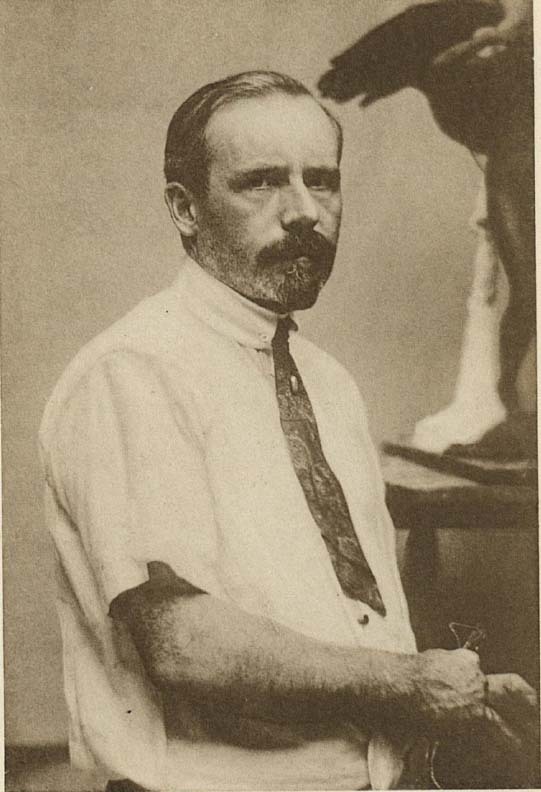 Aside from that however, it has less significance than the one a score of years later, on which he decided to make sculpture his profession The way of the sculptor was hard in those days and there were few inducements toward such a choice. A glance at these by-gone conditions may aid us in realizing the progress which has taken place in three decades. By 1890 the tide of our National taste had turned. Only since the Centennial Exposition of 1876 had there been any marked indications of the change. There, the visitors had their eyes opened to what Europe had to offer in the way of Art, notwithstanding that some of the paintings and objects exhibited could come within this category only by courtesy. Travel, too, was rapidly becoming less costly and not so difficult, and the people who had gone abroad were coming back with higher standards and broadened tastes. The voices of Hunt, Saint-Gaudens and John La Farge were beginning to be heard in the land. Photography was aiding by substituting inexpensive and accurate prints for the poor and costly engravings which had preceded them. Several groups of architects were just coming into prominence, and with their rise, sculpture, always in close alliance with its sister art, began to find a steadier demand for its output and a better understanding of its decorative possibilities and limitations. In consequence, the succeeding decade saw a tremendous growth in the plastic art—saw it develop into a medium of expression excelled only by painting. When sixteen years of age, Mr. Wein- man was apprenticed as a carver of wood and ivory under Kaldenberg. He attended the classes at Cooper Union, and by the time he had reached his twentieth year, he was enabled to enter the studio of Philip Martiny. Here he worked until 1895. Mr. Martiny is one of the best teachers to whom a young sculptor could have gone for his first instruction. His work is characterized by a technical excellence far above the average. Born in Alsace, his heritage of good taste gave him an advantage over his competitors. Part of his training had been received in France, and in America he had come under the influence of Saint-Gaudens early in his career. 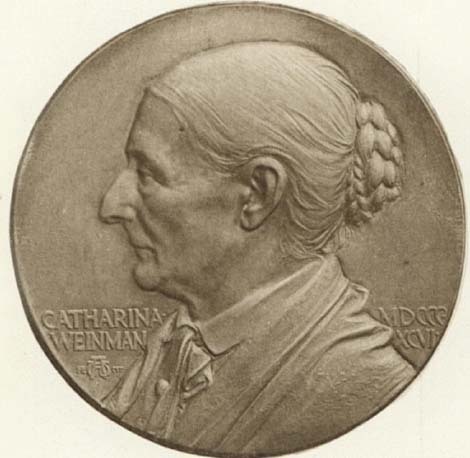 Although most of Martiny's work was in the round, it was in these early years that the first stimulus towards medallic expression came to Mr. Weinman. At the World's Columbian Exposition in Chicago, in 1893, a room was devoted to the work of European medallists, and this proved a revelation to the young student. Enquiry into methods and pro- cesses followed, and the development has continued ever since. In 1895 Mr. Weinman was promoted to the post of assistant in the studio of Olin L. Warner. A brief word will make clear the reasons for this listing of his instructors. Too often the sketch of an artist's career becomes little more than a roll of the masters under whom he worked. Such a mere list, however, has significance. Those familiar with the history of painting know that the number of pictures attributed to Rubens is far greater than could have been produced by a single man in a long lifetime. More than most of the other masters of painting, he used his pupils for the preparation of his canvases and the drudgery of his many huge pictures. Just such a procedure maintains in the studios of sculptors, and especially where the work is being executed in marble. The master supplies the design or model and the pupils carry out his instructions. The block is hewn down from the proportions in which it was received until it begins to assume the form demanded by the subject. The wax or clay model selected as nearest to the ultimate intention of the master is then copied roughly; but not until his figure is to be seen as through a veil does the master begin his work. Previously, of course, he will have been watching his pupils with jealous eyes lest a careless blow endanger his creation. Then, like Galatea under the touch of Pygmalion, the figure begins to take life at his hands. The niceties of the finished work begin to appear. Naturally, master and pupil must be in close sympathy else they could not work together. A comradeship of thought and deed which has continued for several years makes the pupil the spiritual son of his master. Consequently, the roll of those who have inspired and led the thought of the beginner is of more than casual significance, because to anyone familiar with the work of these masters it shows what influences have been guiding the hand and spirit. His education begins as an assistant, and is supplemented by such courses at schools as the evening classes permit. Gradually he develops until he assumes the role of a collaborator—a co-laborer, with his master. Sometimes, though not frequently, this assistance is acknowledged—Mr. French's figures of "The Continents" which adorn the New York Customs House, bear his signature "Assisted by A. A. Weinman." When the master feels that he has given of his best to his pupil, the youngster is pushed out to make his own way and become a master in his turn and in his own right. The interest in medals which the exhibition at Chicago had awakened was further stimulated in Warner's studio when Mr. Weinman assisted on the bronze doors of the Congressional Library. Warner had produced a series of portrayals of the American Indians which are among the best of the early medals produced in this country. Mr. Warner, however, died very suddenly, within nine months after the time Mr. Weinman had begun to work with him. This catastrophe brought to Weinman an invitation to enter the studio of Augustus Saint-Gaudens as his assistant. It is to Augustus Saint-Gaudens more than to any other single artist that we owe so much for his effort to awaken this country to the importance and value of fine sculpture. He achieved an enviable position of respect and admiration. A natural leader, he stimulated his pupils and assistants with inspiration to which they all testify. In consequence, there was the greatest benefit in coming under his direction. 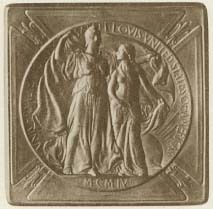 Because Saint-Gaudens was a master of bas-relief, Weinman's interest in medals received added encouragement. In 1998 Saint-Gaudens left for Europe, and Mr. Weinman then entered the studio of Charles H. Niehaus. Here, for little more than five years he worked under the influence of another of our prominent American sculptors. Then followed two years of collaboration with Daniel C. French, and feeling that his preparation was now adequate, he set up a studio for himself in 1906. During this time his interest in medals had been growing steadily, and occasional plaques had been produced in spare moments. One of the earliest of these is the portrait of his mother modelled as early as 1896. Portraits of children followed in 1898 and 1900. An official commission for the Louisiana Purchase Exposition in 1904 gave opportunity for a different type of medal. 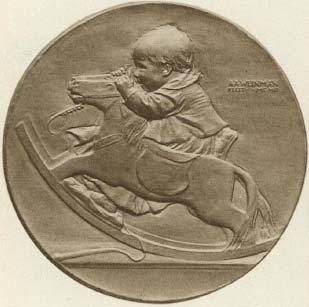 There came an opportunity to collaborate with Saint-Gaudens in the Roosevelt Medals (1905). In 1906, the Life-Saving Medal was designed, and followed in the next year by the Award Medal of the American Institute of Architects. 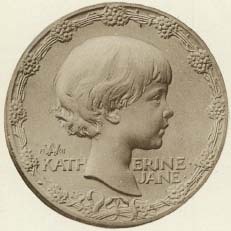 Portrait plaques were finished in 1910, and during 1911 designs for the new dime and half-dollar were carried to completion. Two charmingly decorative medallions of his little daughter were completed in 1915, and in 1918 he finished the J. Sanford Saltus Award Medal given by the American Numismatic Society for artistic achievement in the art of the medal. Mr. Weinman has since been awarded this medal. A War Service medal for Mount Sinai Hospital, finished early in 1920, is the latest of Mr. Weinman's productions in this field. A study of these medals will show a development which has been consistent in reaching toward better things. Portraiture, which is the chief objective in the earlier medals, is achieved with a growing sense of ease and power in each succeeding design. The composition steadily grows more skilful and the problems faced become more complicated without the result being the less happy. 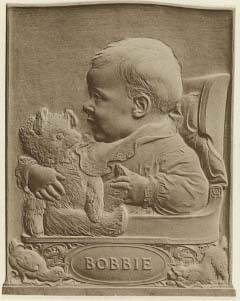 Mr. Weinman's skill in modelling children is shown in the "Rocking-horse Baby", and the plaquette of "Bobbie" with his lifelike attendant. In the Saltus Award Medal Mr. Weinman has over-come a series of difficulties with a happiness that brooks comparison with the work of some of the Renaissance medallists. In the following list of Mr. Weinman's medallic work, the metal of which the piece is struck is indicated for the Award Medals. Many of the portraits are galvanos. Most of these medals may be seen at the Museum of the American Numismatic Society. CATHARINA · WEINMAN · MDCCC · XCVI · Bust of the artist's mother facing to the left. In the field to the left, Aaw in monogram dividing Fe—cit. Medal 90 mm. in diameter. 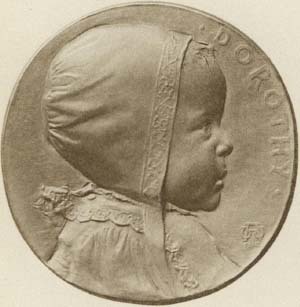 · DOROTHY · Baby's bust facing to right, wearing a bonnet with embroidered band. In the field to the right Aaw in monogram, beneath which is Fecit. Medal 76 mm. in diameter. 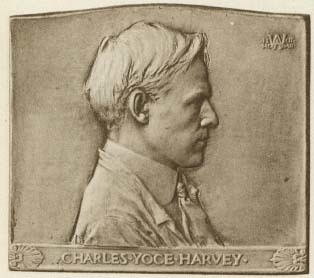 CHARLES · YOCE · HARVEY · Bust facing to right. The inscription in the exergue. In the field near the top and at right Aaw Fecit. Mcmii. Oblong plaque with curved top. Medal 105 mm. × 90 mm. Medal 95 mm. in diameter. Struck at the Philadelphia Mint. Bronze medal 75 mm. in diameter. This medal is worn suspended by a ribbon having a white centre, (for safety), three-quarters of an inch wide, with a band of red, (for danger), on the left and green, (for caution), on the right, each three-eighths of an inch wide. The con- ditions of the award of the Life Saving Medal are stated in the enactment quoted below: Chap. 744: An Act to Promote the Security of Travel upon the Railroads Engaged in Interstate Commerce, and to Encourage the Saving of Life. Be it enacted by the Senate and House of Representatives of the United States of America in Congress assembled: That the President of the United States be, and he is hereby authorized, to cause to be prepared bronze medals of honor with suitable emblematic devices which shall be bestowed on any persons who shall hereafter, by extreme daring, endanger their own lives in saving, or endeavoring to save, lives from any wreck, disaster or grave accident, or in preventing, or endeavoring to prevent such wreck, disaster or grave accident, upon any railroads within the United States engaged in interstate commerce. Provided: That no award of said medal shall be made to any person until sufficient evidence of his deserving shall have been furnished and placed on file, under such regulations as may be prescribed by the President of the United States. Sec. 2. That the President of the United States be, and he is hereby authorized, to issue to any person to whom a medal of honor may be awarded under the Provisions of this Act a rosette or knot, to be worn in lieu of the medal; said rosette or knot and ribbon to be each of a pattern to be prescribed by the President of the United States. Provided: That whenever a ribbon issued under the Provisions of this Act shall have been lost, destroyed or rendered unfit for use without fault or neglect on the part of the person to whom it was issued, a new ribbon shall be issued to such person without charge therefor. Sec. 3. That the appropriations for the enforcement and execution of the Provisions of the Acts to promote the safety of employees and travellers upon railroads are hereby made available for carrying out the Provisions of this Act. Approved, February 23, 1905. Obv. A triangular planchet with curved sides. In a circular reserve, a draped female figure wearing a Liberty cap, throws about her shoulders and about a more youthful figure, an American flag whose folds occupy the field. At the lower right, the rising sun with its rays. · VNIVERSAL · EXPOSITION · SAINT · LOVIS · VNITED · STATES · OF · AMERICA · In the exergue · M · C · M · IV · The space outside the reserve is filled with stars. Wreaths are at each point of the triangle; within the wreath at the upper left, U S; at the right, J N; below, fleur-de-lys. Rev. 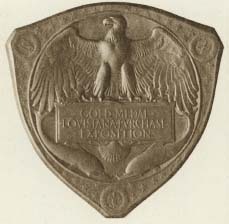 An American eagle with outspread wings above a cartouche bearing the inscription · COMMEMORATIVE · MEDAL · | · LOVISIANA · PVRCHASE · | · EXPOSITION · Beneath the reserve, two dolphins, opposed, with a scallop shell above them. The field outside the reserve is treated as on the obverse. Medal 70 mm. × 70 mm. This design also used for the GOLD MEDAL. Obv. On a shield-shaped flan a circular reserve as described above for the Commemorative Medal. The reserve is imposed upon the shield of the United States. Rev. An American eagle with outspread wings above a cartouche bearing the inscription · GRAND · PRIZE · | · LOVISIANA PVRCHASE · | · EXPOSITION · Beneath the reserve, two dolphins, opposed, with a scallop shell above them. The field outside the reserve is treated as on the obverse. Medal 74 mm. × 65 mm. Obv. On a square planchet, a circular reserve as described above for the Commemorative Medal. The field outside the reserve is filled with a Maltese cross, between the arms of which are fleur-de-lys. Rev. An American eagle with outspread wings upon a cartouche bearing the inscription SILVER MEDAL | · LOVISIANA · PVRCHASE · | · EXPOSITION · Beneath the reserve, two dolphins, opposed, with a scallop shell above them. The field outside the reserve is treated as on the obverse. Medal 67 mm. × 67 mm. Obv. A circular flan similar to the reserve of the Commemorative Medal. Rev. Similar to above save that the word BRONZE replaces the word SILVER in the inscription. Medal 63 mm. in diameter. Rev. · WASHINGTON · D · C · MARCH · IV · M · C · M · V · In field to left, E · | · PLVRIBVS ·, at right · VNVM · The figure of an eagle standing on rocks and facing to left. Below, the initials of Augustus Saint-Gaudens and A. 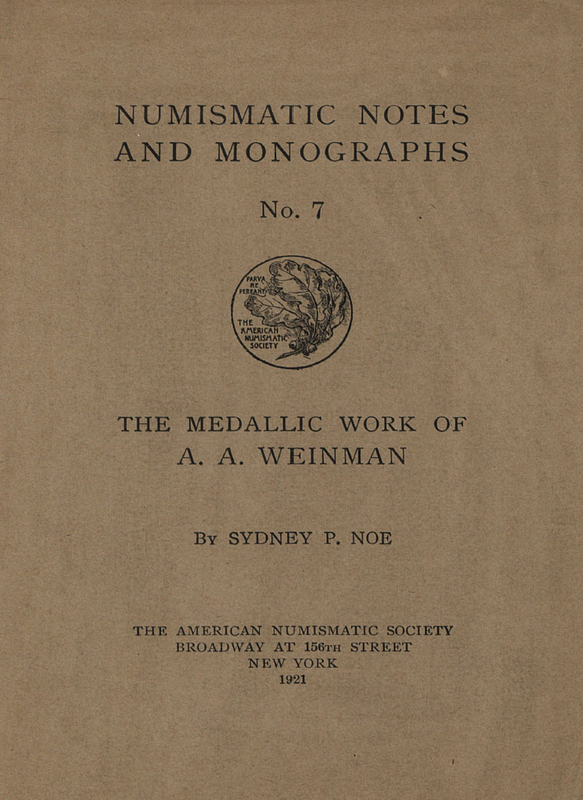 A. Weinman in a monogram. For an account of the arrangements for this medal, and of the share in its form taken by Mr. Saint-Gaudens, the reader is referred to the correspondence between President Roosevelt and Mr. Saint-Gaudens, printed in The Century for April, 1920. Bronze (cast) medal 74 mm. in diameter. Obv. * PRESENTED · BY · THE · AMERICAN · INSTITVTE · OF · ARCHITECTS * ORGANIZED · M · D · C · C · C · LVII · Bearded and laureated heads of Polygnotos, Ictinos and Pheidias facing to the left. Beneath, a compass, triangle, brush and sculptor's modelling tool. Medal 55 mm. in diameter. Obv. Head of Apollo facing to the right bound with a wreath of laurel, the ribbons filling the field at the back. Beneath the chin, the artist's monogram in a cartouche; the whole in a circle of dots. Rev. A Roman lamp with three flames surrounded by rays. Beneath NATIONAL · INSTITVTE · | · OF · ARTS · AND · | · LETTERS · Border of dots. Gold medal 57 mm. in diameter. The Gold Medal of the Institute is annually awarded to any citizen of the United States, whether a member of the Institute or not, for distinguished service to arts or letters in the creation of original work. (I) "That the medal shall be awarded for the entire work of the recipient, without limit of time during which it shall have been done; that it shall be awarded to a living person or to one who shall not have been dead more than one year at the time of the award; and that it shall not be awarded more than once to any one person. (2) "That it shall be awarded in the following order: First year, for Sculpture; second year, for History or Biography; third year, for Music; fourth year, for Poetry; fifth year, for Architecture; sixth year, for Drama; seventh year, for Painting; eighth year, for Fiction; ninth year, for Essays or Belles-Lettres—returning to each subject every tenth year in the order named. (3) "That it shall be the duty of the Secretary each year to poll the members of the section of the Institute dealing with the subject in which the medal is that year to be awarded, and to report the result of the poll to the Institute at its annual meeting, at which meeting the medal shall be awarded by vote of the Institute." The first award—for sculpture—was to Augustus Saint-Gaudens. The medal was presented to Mrs. Saint-Gaudens at the meeting held in memory of her husband, November 20, 1909. The second medal—for history—was awarded to James Ford Rhodes, 1910. The third medal—for poetry—was awarded to James Whitcomb Riley, 1911. The fourth medal—for architecture—was awarded to William Rutherford Mead, 1912. The fifth medal—for drama—was awarded to Augustus Thomas, 1913. The sixth medal—for painting—was awarded to John Singer Sargent, l9l4. The seventh medal—for fiction—was awarded to William Dean Howells, 1915. The eighth medal—for essays and belles-lettres—was awarded to John Burroughs, 1916. 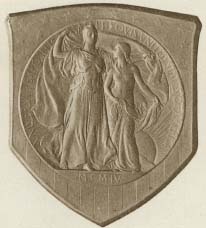 The ninth medal—for sculpture—was awarded to Daniel Chester French, 1917. The tenth medal—for history or biography—was awarded to William Roscoe Thayer, 1918. The eleventh medal—for music—was awarded to Charles Martin Loeffler, 1919. 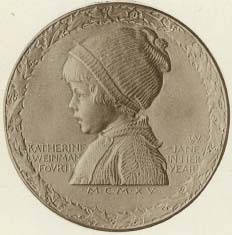 KATHERINE JANE · | WEINMAN IN · HER | FOVRTH YEAR · Child's bust facing to left with knitted cap and sweater. Beneath the bust · M · C · M · XV · In field to right Aaw in monogram dividing Fe—Cit. The whole in a decorative border of holly. Medal 97 mm. in diameter. KATHERINE · | JANE · Child's head facing to right in a border of marguerites in clusters of three, the stems tied by a fillet below the neck. In field to left Aaw in monogram dividing Fe—Cit. In a high chair facing to the left, a child clasping a "Teddy Bear". In the exergue, BOBBIE in a cartouche; at the left, a duckling; at the right, a puppy. The field on either side of the cartouche is filled with decoratively arranged fillets. To the right on the arm of the chair, Aaw in monogram. Oblong plaque, with top slightly curved. Medal 150 mm. × 120 mm. Obv. In the centre an upright female figure, with drapery in graceful lines and a cuirass decorated with a caduceus, supports a youth with bandaged head. His left hand grasps a broken sword; his shield is still upon his arm. At the back, a glowering man with helmet, cuirass and greaves, supports a sword on his right shoulder and holds in his left hand a four-headed serpent. At the lower left, a tree stump and ruins in flames. At the right, an oak tree from which a single branch has sprouted. Rev. A wreath with ornate fillets and caduceus. At left, 1917. At right, 1919. Inscription reads IN · COMMEMORATION | OF · THE · PATRIOTIC · SERVICE · OF · THE | PHYSICIANS · SURGEONS · AND · NURSES | COMPRISING · THE · MOUNT SINAI · HOSPITAL · UNIT · BASE · HOSPITAL · NUMBER | THREE · DURING · THE · WORLD · WAR | THIS · MEDAL · IS · PRESENTED | BY · THE · TRUSTEES · OF · MOUNT | SINAI · HOSPITAL · TO —. Below, ribboned panel for a name. Bronze medal. 75 mm. in diameter. Obv. A slender female figure, wearing a Phrygian cap, seated beneath a tree. In her left hand she holds the model for a medal; in her right, a modelling tool. About the rim PARVA · NE · PEREANT, (the motto of The American Numismatic Society). At the lower right, the monogram of the artist. In the exergue A · N · S · and the device of the Society—a twig with three oak leaves and three acorns. Rev. In a slightly sunken circular field, Pegasus mounting to the left. Cloud masses, partly covering the rayed disc of the sun, fill the field at the lower left The inscription in concentric lines reads THE · J · SANFORD · SALTUS | AWARD · MEDAL | OF · THE · AMERICAN · NUMISMATIC · SOCIETY | FOR · SIGNAL · ACHIEVEMENT | IN · THE · ART · OF · THE · MEDAL · Dividing the inscription on the left, a branch of laurel; on the right, a branch of oak. This silver medal is awarded annually for artistic achievement. The fund which establishes this award provides a small income which is set aside for the purchase of the artists' medals not already in the collection of The American Numismatic Society. Medal 78 mm. in diameter. 1898 Circular medallion 75 mm. 85 mm. wide × 125 mm. 1900 Circular medallion 75 mm. 1900 Upright rectangular plaque, young girl with hoop. 133 mm. wide × 230 mm. 60 mm. wide × 127 mm. Ernest Babelon. Les Médailles Historiques du R�gne de Napoleon le Grand, Empereur et Roi. Paris. 1912. Folio, lx, 430 pages printed in three tones, a special border for every page. Illustrating two hundred unpublished drawings of Napoleonic medals, .... by Chaudet and Lemot for .... the French Institute. $20.00. Agnes Baldwin. The Electrum Coinage of Lampsakos. 1914. 36 pages. 2 plates. $1.00. Edward T. Newell. The Seleucid Mint of Antioch. 1918. 137 pages. 13 plates. $5.00. Edward T. Newell. Tarsos under Alexander. 1919. 47 pages. 8 plates. $2.50. Bauman L. Belden. War Medals of the Confederacy. 1915. 12 pages. 1 plate. $1.00. Bauman L. Belden. United States War Medals. 1916. 72 pages. 9 plates. $2.00. Edgar H. Adams and William H. Woodin. United States Pattern, Trial and Experimental Pieces .... issued by the U. S. Mint from 1792 up to the present time. 1913. 204 pages. Illus. Cloth, $3.00. Edward T. Newell. The Alexandrine Coinage of Sinope. 1919. 11 pages. 2 plates. $2.50. Agnes Baldwin. The Electrum and Silver Coins of Chios. 1915. 60 pages. 7 plates. $2.00. Albert R. Frey. Dictionary of Numismatic Names. 1917. 311 pages. $5.00. Henry C. Miller and Hillyer Ryder. The State Coinages of New England. (Conn. — Vermont — Mass.). 7 plates. $3.00. Moritz Wormser. Coins and Medals of Transylvania. 9 plates. $3.00. Theodore Spicer-Simson. Portrait Reliefs, Medals and Coins in their Relation to Life and Art. $1.50. Robert W. McLachlan. The Copper Tokens of Upper Canada. 4 plates. $3.50. Eugene G. Courteau. The Wellington Tokens relating to Canada. 2 plates. $2.00.